The project is an artistic exchange between artists from Sweden, Rwanda, Kongo and Uganda. The artists performed for children and youths in Kigali. 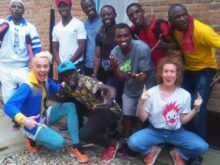 In December 2016, Clowns Without Borders Sweden did a performances tour to the big refugee camps around Rwanda, in collabroation with Gisenyi Acrobats. In June 2015, Clowns Without Borders Ireland implemented a very successful project in Rwanda and made good contacts for future projects. They worked with local acrobats and performed 10 shows for 6400 people. 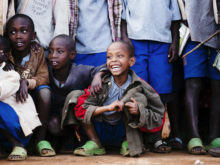 In October 2014, Clowns Without Borders Sweden gave circus workshops in Rwanda, as well as shows for 25,000 people. In 2014, Clowns Without Borders Sweden managed to give 52 workshops throughout Rwanda. In 2013, Clowns Without Borders Sweden went to Rwanda to perform 6 shows for 1370 people.